Prepare the Yantra as shown in the diagram and then worship it with offering of scented flowers, agarbatti and pure Ghee Diya. Then fold and keep it inside a cloth Tabeez; or a metal locket and tie it around the right forearm or around the neck. The same Yantra can also be carved on a piece of gold or silver and used in the manner explained above. Ashtagandha Paste is available anywhere in India. Saffron Paste means putting a drop of water in dried Saffron to prepare a paste. 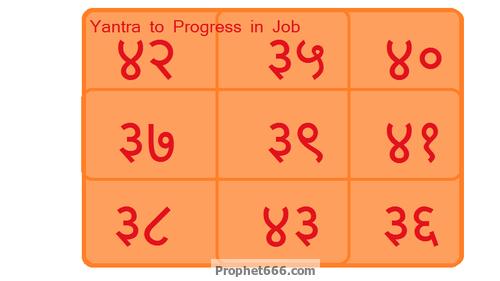 If the Yantra gets old or spoiled immerse it in water and prepare a new one if you want to. ones; if you so wish you could try keeping them in your purse or pocket.